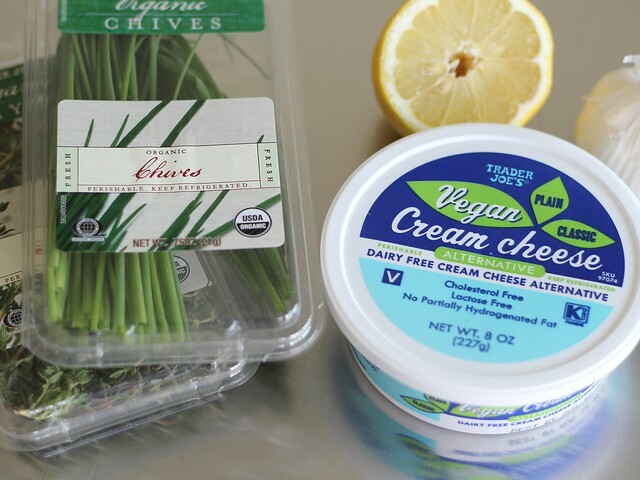 If you’re looking for a dairy-free alternative to an old favorite, garlic and herb goat cheese, give this vegan take a try. The “cream cheese” alone lacks the usual, slight tang of its Philly counterpart, but a touch of lemon juice is all you need to lend it that missing edge. A little bit of seasoning is all it takes to elevate an otherwise beige (literally and figuratively) product to something crave-worthy! 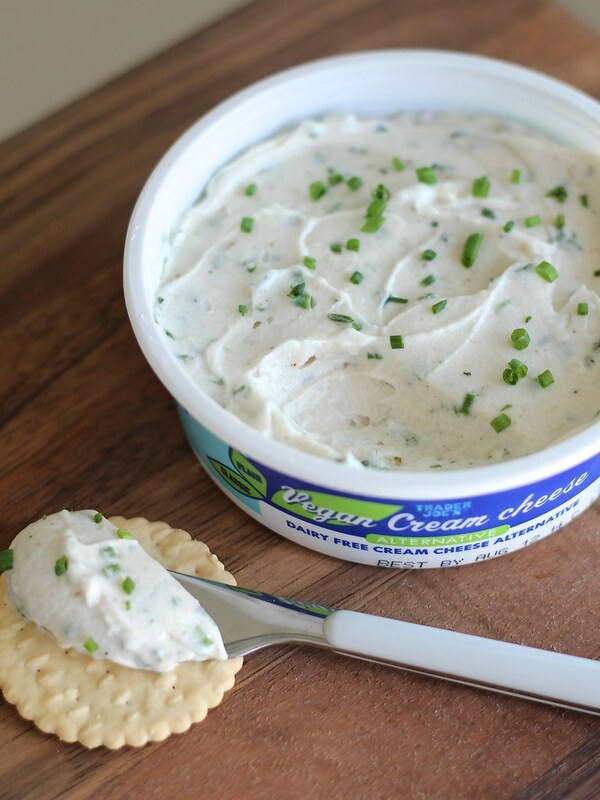 What’s your favorite way to jazz up vegan “cheese”? (On the sweet side, I’m partial to these chocolate “cream cheese” cupcakes.) Let’s talk in the comments or on Facebook or Twitter! 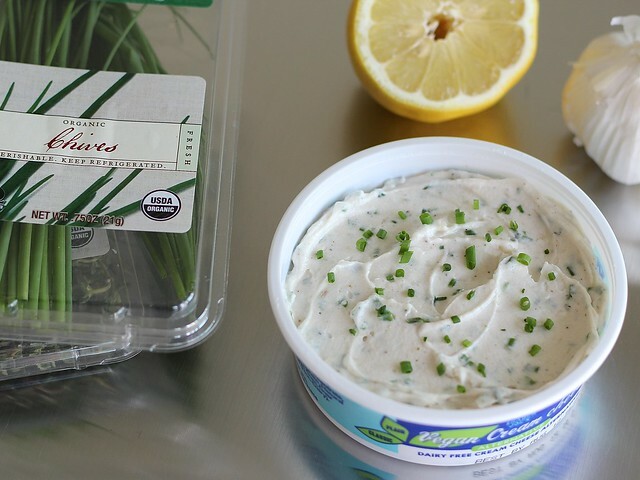 Spread the finished product on bagels or crackers, or use it as a dip for raw veggies or chips! Also, if you want, you can easily make this without the aid of a stand mixer — a hand mixer or simply a spoon and a few minutes of stirring will work just fine. On a cutting board, sprinkle minced garlic with Kosher salt and mash garlic into a paste. Transfer garlic paste, pepper, vegan cream cheese and lemon juice to the bowl of a stand mixer fitted with the paddle attachment. Mix on medium speed for a minute or two until well-combined and somewhat fluffy. Stir in chives and minced thyme. Season to taste with additional salt and pepper, if needed, and transfer mixture to a small storage container; garnish with chives. Cover and refrigerate for several hours before using, use within about 5 days. Is this “Cream Cheese” soy free? I will try it if it is cashew-based as I have made “Herbed Cream Cheese” with soaked cashews and it is very good, but this would be quick and convenient. I just recycled the container today, but I’m pretty sure that the Trader Joe’s brand of vegan “cream cheese” is soy-free (I’d definitely recommend double checking at the store). Daiya does makes a gluten-free, dairy-free, soy-free option that would work well, too: http://us.daiyafoods.com/products/dairy-free-cream-cheese/plain-cream-cheese-style-spread.